Online Registration is closed. Members and Guests may register at the door. Join us and the Aaron Achenbach Insurance Agency - State Farm Team for our April business social hour at Cowboy Jack's. 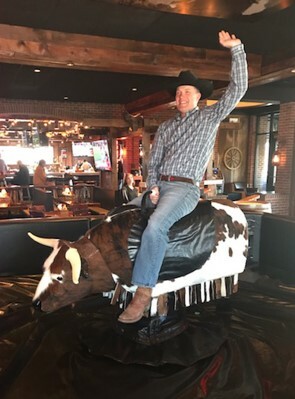 Stop on by and enjoy some complimentary appetizers, cash bar and feel free to hope on the mechanical bull. Bring your colleaques and plenty of business cards. Thank you Aaron Achenbach for hosting! 1262 John Q. Hammons Dr.